We have recently seen that most of the websites were using Facebook comments instead of default wordpress comments. Especially sites that have huge engagement rates on their fan page are using Facebook comments, for example take a look at TechCrunch. How about you, does your Facebook page has high exposure, are your people more engaged in Facebook; then why not add Facebook comments to your wordpress site. To create brand awareness and to build a large user base Facebook offers several social plugins for your site. Facebook Like box let your site visitors know that you have a page on Facebook, so that real peoples can join your community and share their thoughts. Share button that lets people to share your web content on Facebook. Embedding posts allows you to embed any public Facebook posts in your blog etc and one among them is Facebook comments plugin which when added allows people to comment on your site. Here we will see how to add / install Facebook comments in your wordpress website. But before adding this plugin we will see the advantages and disadvantages of Facebook comments. First of all most people who visit your website will stay signed in to their Facebook account which encourages more comments on your posts. Real names and real people will greatly reduce anonymous comments on your blog which keeps the topic more engaged. No spam, all the links in comments are nofollow, people can follow posts and moreover the comments are threaded. The main disadvantage and the worst thing about Facebook comment is that you cannot backup comments as you can do it in Disqus. So in feature if you choose to switch to some other commenting platform then all your comments are lost. Since there is no support for Google and Twitter, only Facebook peoples can post comments. But anyhow you can always have default wordpress comments activated along with Facebook comments. Alright! Let’s see how to setup Facebook comments in your wordpress site. If you go to developers.facebook.com/docs/plugins you can see the list of Facebook plugins available. In there you will see comments plugin just open that, enter your blog URL, choose width, number of posts, color scheme and when done click on get code at the bottom. Now you will be provided with two piece of code in which the first one goes to your site’s header.php file and the second one goes to comments.php file. By using this manual method most beginners will struggle to integrate, so the other easy way to add Facebook comments is by using a wordpress plugin. So first install and activate Facebook comments plugin in your wordpress site. After activating this plugin go to settings >> Facebook comments where you will see a message to enter App ID. To make this plugin work you have to create a Facebook app and enter your ID. To create a new app go to this page and then click on create a new app at the top right corner. Now enter the display name as anything you like (for example: your site name), leave the namespace, choose category and then click on create App. Now you will be provided with App ID and App secret key. Just copy the app Id and paste it in main settings field of your plugin. Next choose the display settings and other settings depending on your needs and when done save changes, that’s it! Additionally this plugin has shortcode functionality, just add [fbcomments] anywhere in your site and you will get Facebook comment box. 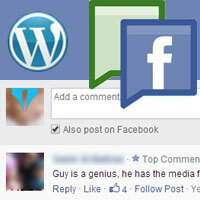 You have now integrated Facebook comments in your wordpress site. What do you think is it worth? Please let us know by comments.